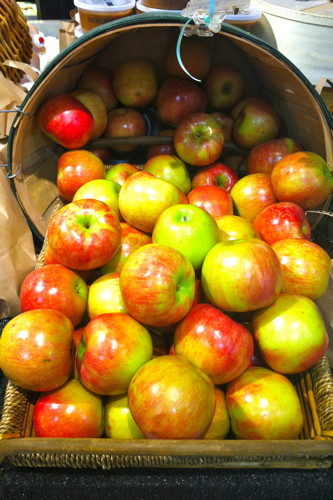 Apples are abundant in the fall and lend themselves to baking. But who wants to make an apple pie? Apple crisp is a wonderful substitute, because it's quick and easy. It only takes a couple of apples and just a few staple ingredients. 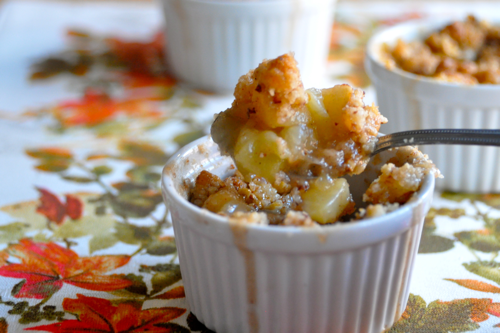 This apple crisp has a few extra spices,but feel free to omit or substitute for what you have on hand. 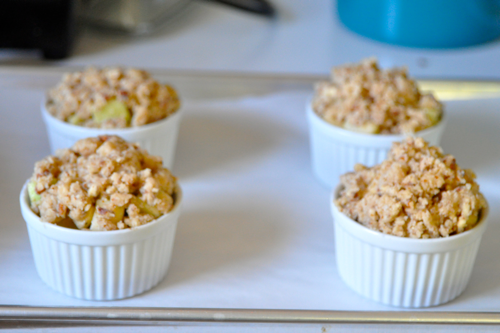 It's sure to warm your home as well as your heart with the bubbling, soft apples and crumbly topping. Combine apples, flour, sugar, cinnamon, cardamom, black pepper, and vanilla. Set aside. Combine all ingredients for topping. 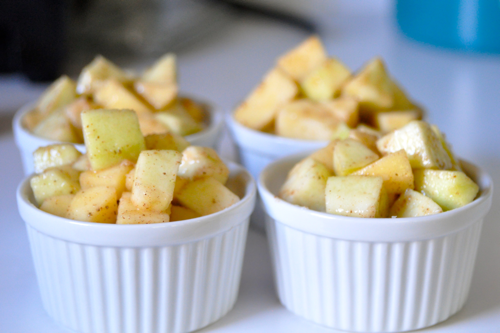 Fill four six ounce ramekins with apples. 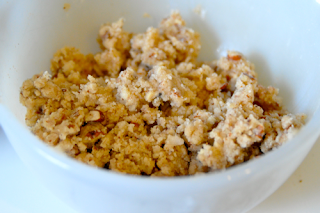 Top with 2-3 tablespoons of topping. Bake 375 for 15-20 minutes or until golden brown. Garnish with ice cream or whipped cream and crystalized ginger. 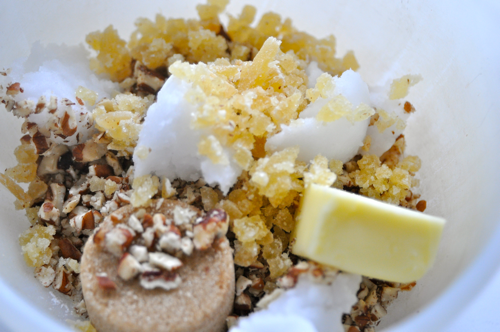 You can freeze leftover topping for future use. 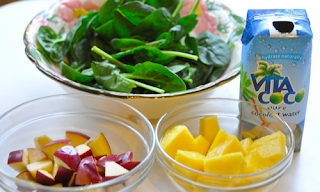 Have you heard all the rage about green smoothies? They are the latest and greatest food craze. It is basically a smoothie made mostly of kale, spinach, lettuce, parsley, celery etc. Given that there are many benefits to eating deliciously green veggies. My friend in dayton was nice enough to come over and experiment with me to come up with a delicious green smoothie. This is a slight variation of what we came up with. 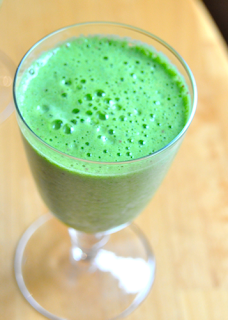 If you like to drink your veggies, give this green smoothie a try! Place all ingredients in a blender. Blend until smooth and there are no chunks left. Enjoy the health benefits and the great taste of this green drink! Better than your average rice! This rice is inspired by a restaurant I frequented in Athens, Ohio, Casa Nueva, it was one of my favorites during my time spent there. They focused on local and seasonal ingredients. They make amazing mexican food such as tacos, enchiladas and beans and rice. Many of their dishes are served with a fabulous herbed rice. It is simple, elegant, and elevates any dish. Now that I live in Dayton, I had to make my own version to bring me to back to that fantastic restaurant in Athens. Heat water until boiling. Add rice and salt. Stir to combine. Turn heat to low and cook covered for 15-20 minutes or until liquid has evaporated. Let sit covered 5-10 minutes. 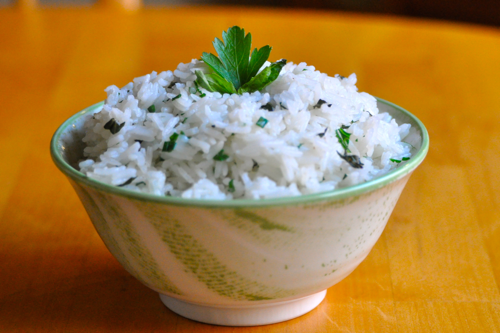 Fluff rice with fork and add herbs and butter. 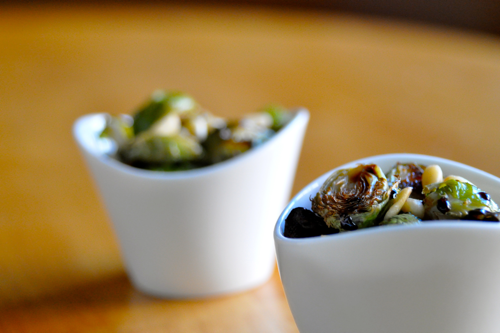 A delicious way to serve brussel sprouts! 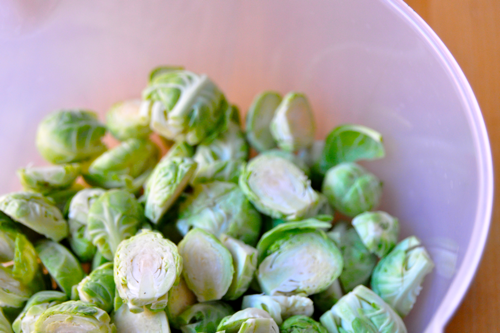 Brussel sprouts are an amazing vegetable. I don't think they get much credit in food world. I used to hate sprouts as a young child and even throughout high school. Then I had them roasted. It changed everything. 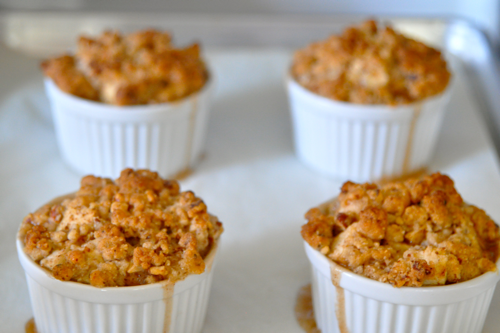 It made them sweet,tender and gave a depth of flavor with crispy edges. Now this is the main way I prepare these wonderful tiny cabbages. Roasting is a must learn technique. It makes so many vegetables shine, especially those that are earthy. 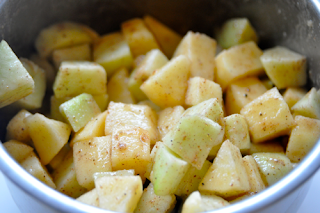 It caramelizes the sugars to bring out an amazing sweetness. So I encourage you to give these veggies another try. You might be surprised at the results. Don't be afraid to try them using other techniques as well. They are great shaved or chiffonade in salad. A quick saute with some pancetta. 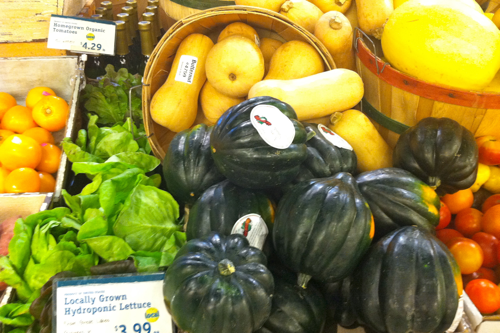 So enjoy these wonderful veggies and all their nutrients. Toss sprouts in oil, salt and pepper. Roast at 400 degrees for 10-15 minutes or until tender. While still warm, drizzle with balsamic and garnish with toasted pine nuts. Sprouts in all their glory! 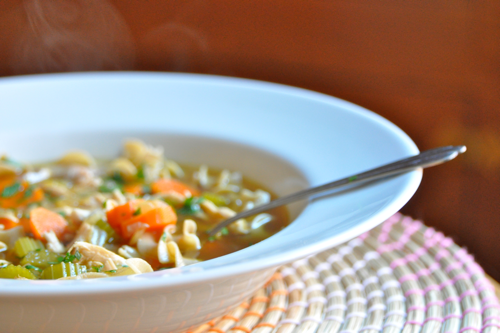 A short cut chicken noodle soup! Nothing says comfort food like chicken noodle soup. This was the first food my mom would make when I was sick as a child. As I was laying in bed, I could smell the hearty broth and chicken cooking. 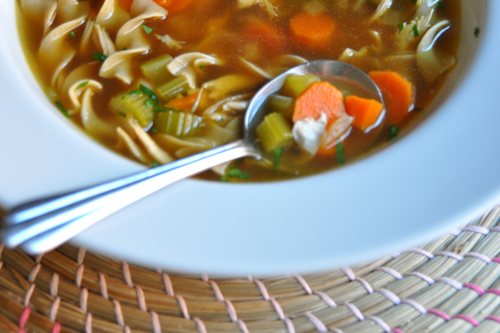 The warmth of the savory broth and the chunks of vegetables always made me feel better. It became a tradition when I get sick. While at college with a cold or flu, being taken care of was not an option. So I found a shortcut way to make this classic and comforting soup. I changed it slightly from my moms version. 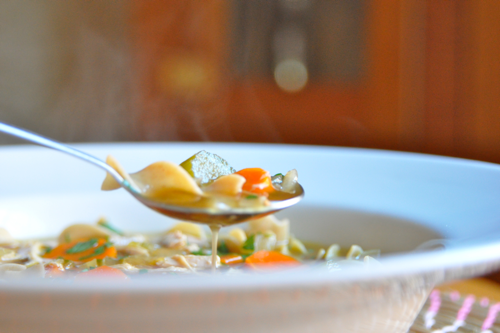 But I am still convinced that this soup will cure any cold or flu. This is my go to soup, that I eat all week when I am sick. This recipe can comfort you too. The best part, it takes little to no time to make and tastes great. It is best with homemade chicken stock. Heat stock pot and add oil. When oil shimmers add onion and saute 2-3 minutes. 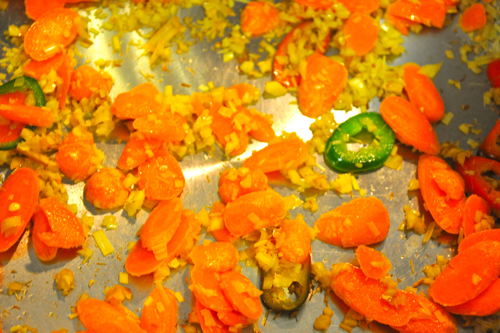 Then add carrots and celery and cook 3-4 minutes more. Add stock and bay leaves. Let simmer until vegetables are cooked. Add chicken. At the last moment add parsley. To plate, place a small amount of cooked noodles in the bottom of the bowl. Then add enough hot broth to fill the bowl. Fall is a fabulous time in Ohio. The leaves are changing color and the weather is slightly cooler. The orange, reds and browns are surrounding you. Leaves are falling to ground and covering the streets. Fall foods are hearty and warm. 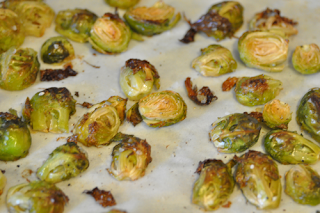 They invite you to eat them with their earthy flavors. It is a time of comfort food, which warms you from within. 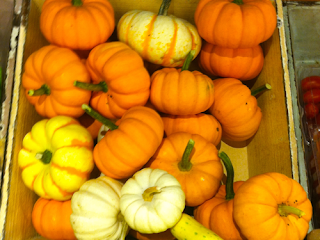 So make some hearty dishes with these amazing fall foods. I will be focusing on utilizing these ingredients for the season and I hope you do too! The smell of lemongrass, ginger and peppers fills the air. You can hear sizzling and sautéing in the back kitchen. There are bowls of jasmine rice and curry sauces, with mounds of different veggies and meat. The brightness of fresh cilantro and basil is on every plate. This is the sight and sounds of one of my favorite types of restaurants, Thai. The food is so flavorful and vibrant on the plate. Its hard to resist the sour, sweet, salty and spicy flavors of these delightful dishes. The menus beam with choices from sushi, stir fry and a multitude of curries. Thai food is a favorite in the Dayton area. We have many Thai restaurants, which all have great dishes and their own personality. They each make their curries slightly different and offer unique dishes, as well as sushi. Soup is a staple at all of these restaurants with a least a few choices on the menu. Each are good in their own right. Thai soup is full of fresh vegetables and thinly sliced meats. Its garnished with fresh herbs, which makes the dish complete. They are light in calories but high in flavor. 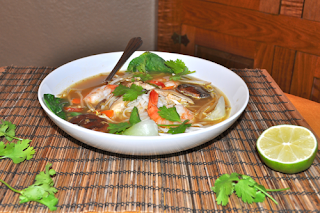 Here is my take on a thai favorite. 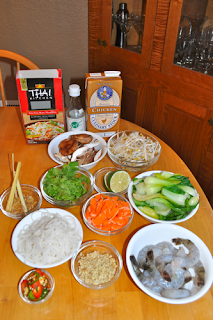 Make this thai dish and take a trip to your favorite thai restaurant. 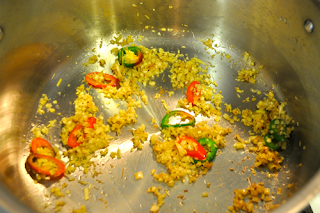 Saute lemongrass, ginger and peppers in oil. Add carrots and continue to cook for 2-3 minutes. 20 minutes. Add mushrooms and cook 3 minutes more. Step 4: Add shrimp and cook 2-3 minutes and remove. Before serving, squeeze in lime juice to taste. Garnish with cilantro, basil and bean sprouts. 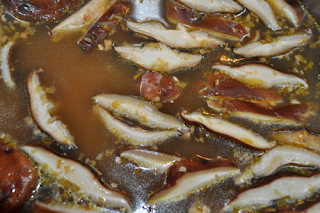 You may also strain the soup before you add the mushrooms for a cleaner broth. To assemble, place 2 bok choy leaves in bowl on opposite sides. Place a small pile of noodles in the middle. Then place broth around noodles and on bok choy. 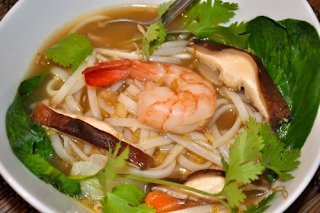 Then top with shrimp, bean sprouts, cilantro and basil.